The one thing I always have in the refrigerator: hummus. I love it with pretzels and it’s usually a snack that can be devoured quickly. As much as I love it I do get tired of it after several days of walk by dipping. I was at my favorite Mediterranean market in Dallas, World Foods, buying my stock of olives and feta and checking out the baked goods swimming in honey. I noticed a big pile of fresh whole wheat Naan* and this pizza was born. I have to say it was everything I thought it would be. Don’t skip the vinaigrette drizzle over top and on the veggies. The acid from the vinegar is a perfect compliment to the creamy hummus. *Naan is an Indian flatbread and is thinner than most pita. 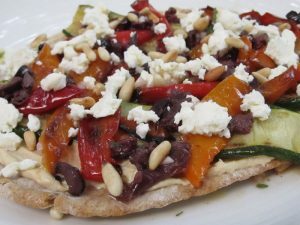 Pita would also work fine in this recipe – use what you can find! For the vinaigrette: Combine all ingredients in a container with a tight-fitting lid, then add the oil and shake to mix well. Add 2-3 tablespoons to a medium bowl to toss the veggies in. Preheat oven to 350 degrees. Place Naan or Pita directly on rack and bake for 5-10 minutes until bread is crispy. It will not be baked again, so make sure to get the crunch you desire. I like mine crispy so I bake it closer to 10 minutes. Heat medium skillet and add 1 tablespoon olive oil. Season zucchini with salt and pepper and cook for 1-2-minutes on each side, until al dente. Remove and add to bowl with dressing. Add bell peppers to the same pan and cook until slightly charred. Toss in the same bowl with the dressing and zucchini. To assemble pizza: Spread hummus on to cooled crust. Layer zucchini in a single layer over the hummus. Sprinkle bell peppers, olives and feta over zucchini. Top with toasted pine nuts and a drizzle of the vinaigrette. This looks fantastic! I will definitely try this one. Love the naan bread!